Brewed in Dallas, Mosaic IPA is very dark for an IPA compared to the norm. Color is similar to tea. Head is also a little darker than normal. The nose is THICK of hops as is the taste. The follow-up taste is bitter but it finishes quickly with a white pepper taste. Mosaic gets its name from the variety of hops used in the brewing process. This Mosaic hop is the main contributor to the immense hoppy aroma and taste come from. While hops are the real stars of this show, the malt provides a depth that helps balance the flavors by working to keep the bitterness in check. 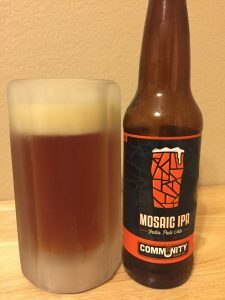 Mosaic is brewed by Community Beer Company which takes its name from what they feel beer is about. Beer is communal they say. It is the central part of a get together with friends, family and even acquaintances. They are passionate about brewing quality craft beer for the folks in North Texas and beyond. They put this belief into action by supporting local events, charities, and local artist. As they say, it is “Beer for the Greater Good”. Links to other posts in this series.